We’ve been lucky. Tampa hasn’t suffered a direct hit by a hurricane since 1921. Last year we got a taste with Hurricane Hermine. It was the first hurricane to hit landfall in Florida in 11 years. The storm flooded homes, downed trees and left thousands without power. But if a hurricane hits are you prepared? The Tampa Downtown Partnership hosted an Annual Hurricane Preparedness Meeting. Speakers from Tampa Fire Rescue, Hillsborough County, TECO Energy, the National Weather Service (NWS) and the National Oceanic and Atmospheric (NOAA) talked to a packed room on the impact of a hurricane. Hurricane season begins June 1 and runs through November 30. This year forecasters predict an above average Atlantic hurricane season. NOAA calls for 11-17 named storms. Two to four of which could be major. One of the first steps is to know your evacuation plan. The zones change every year. They are ranked A-E depending on where you live, with level A being the highest priority. The next step is to have an emergency supply list. “You should never let your car go below half a tank in the summer,” said Holley Wade with Hillsborough County Fire Rescue. The last thing you want is to be stranded on the freeway during an evacuation. While most people head away from the storm, hurricane hunters fly directly to it. 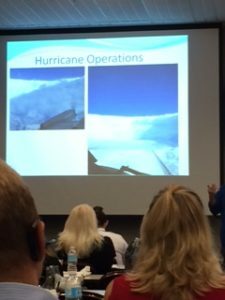 Hurricane hunters are aircrews that collect weather data. Satellites and drones help meteorologists track the path of a storm, but they still rely on aviation. NOAA’s hurricane hunters recently moved their operations from MacDill Air Force Base to Lakeland Linder Airport. Their fleet consists of nine manned aircraft. The pilots fly into the eye of the storm at 5,000 to 10,000 feet above the Earth’s surface. The jet flies around measuring winds. A storm’s name is based on information from the hurricane hunters. “It’s like riding a roller coaster through a car wash,” said NOAA Flight Meteorologist Richard Henning on what it’s like to fly into a hurricane. He’s directed missions into storms such as Hurricane Katrina, Ivan, Charley and more than 40 others. 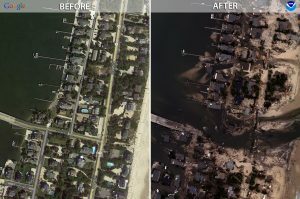 Each plane is equipped to capture images of the 30-40 foot waves and before and after damage. They can also release a device called a dropsonde. It’s designed to accurately measure and track tropical storm conditions as it falls to the surface. There are several apps and alerts to keep you safe. You can sign up for Alert Tampa to receive vital updates. You can also get notifications from the FEMA Weather app. Emergency crews say it’s also useful to have a NOAA weather radio.